Gitzo GT3532LS with Arca-Swiss C1 Cube Head supporting an Arca-Swiss F Metric 8x10 Camera. I was photographing some fallen leaves in a shallow pool of water surrounded by natural oils in reflected light. The Kolob Canyon section of Zion is very quiet, calm, and one of my favorite parts of the park. Whether your tripod is perched atop a steep sand dune, or partially submerged in a flowing river, it is important to have full confidence in your tripod and head combo. I often photograph intimate landscape scenes on the ground, so that adds another level of complexity to precise tripod placement. I use a variety of tripods and heads depending on the camera and location I am shooting. This page shows the exact setup I use, and my thoughts on the equipment. I purchased this tripod in 2013 as a lighter-weight alternative to my 5 series gitzo which weighs substantially more. The Gitzo GT3532LS is a full size 3 series carbon fiber systematic tripod. Rather than having a center column like the mountaineer and traveler series, the systematic series has a flat plate up top. This helps with stability, and also allows you to better position the tripod at awkward angles. Though I initially purchased this tripod as a lightweight alternative to my much larger 5 series Gitzo, I use this tripod most of the time to help reduce the overall weight of my kit. When I need to setup my tripod in deep sand or flowing water, I typically reach for my 5 series Gitzo instead. The increased leg diameter provides even more support. The GT3532LS has since been discontinued, but the current version (GT3533LS) is largely the same design. The first tripod I bought for my 8x10 camera was a Gitzo GT5541LS. 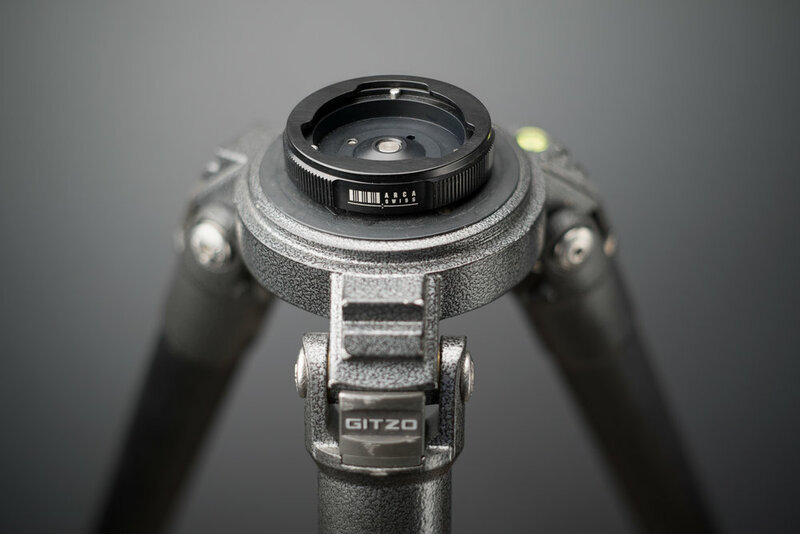 It is a heavy duty 5 series tripod, which is the thickest tube offered by Gitzo. Unlike my other Gitzo that has 3 sections, this 5 Series Systematic tripod has 4 sections for each leg. That allows for a shorter size when retracted, combined with a very impressive height when fully extended. On a smaller tripod, the addition of a 4th leg section might raise concerns about stability, but not on this beast of a tripod. The smallest leg section on this tripod is larger in diameter than the primary tube size on many tripods. I have learned that my smaller 3 series Gitzo is more than sufficient for most subjects, but if I am shooting in deep sand, snow, or flowing water, the thicker leg sections on the Gitzo GT5541LS provide added stability. This is also the tripod I grab if height is a concern. Often times when photographing on a slope, at least one leg must be down slope, so the overall height of the tripod is much lower than one might like. It should be noted that both my Tripods are equipped with an Arca-Swiss Quick-Link system that allows me quickly and easily release the tripod head. You will find more information about the Quick-Link system below. The GT5541LS has been replaced by the GT5543LS which is largely the same design. The Arca-Swiss Cube has been my primary tripod head since the spring of 2017. Before that, I used a G-1570M Gitzo pan tilt head. I was fully satisfied with the rigidity of the Gitzo pan tilt head, but the weight and bulk of that head, combined with the lack of a quick release mechanism, made me consider alternatives. Two very talented photographer friends of mine both suggested the Arca-Swiss C1 Cube tripod head, but I was hesitant at first because of the price tag. This head costs almost double what I paid for the tripod I mount it on, but there is a reason why. The Arca-Swiss C1 Cube is a relatively compact head that is geared for precise control over the composition. Tilting the camera up or down, or leveling it left or right is as easy as turning the compact knobs. Though the adjustments can be done with one hand, it is best to grab both knobs on either side of the tripod head. There is no need to lock the head in position once you have aimed the camera. It will stay where you left it. This is accomplished by the combined effort of the geared mechanism, and a friction control knob. With the size and weight of my 8x10 camera atop the Arca-Swiss C1 Cube, it is best to turn the friction knobs all the way to the positive side. This will apply enough friction to hold the camera in place at any angle without fear of it slipping. When using the camera at an awkward angle as illustrated in the images at the end of this article, geared controls are especially important. They allow you to fine tune a composition with very little effort. In addition to the main two geared controls, this head features dual pan controls. The head will rotate on its base, and can be locked with a simple to operate lever. The upper portion of the head can also rotate, which makes this head suitable for panoramic work on a 35mm based system. You can level the top planform, then pan while the camera is level. If you need to aim your camera up or down, the entire head hinges forward, and can be locked in at any point. It is possible to aim the camera 90 degrees downward or upward using both the hinge, and the geared movement. One of my concerns when switching to this system was stability. The two main controls can never be locked, so I wondered what impact that would have on the camera. Though the cube is a very solid head, it can never be as stable as the Gitzo G-1570M that I have used in the past. That being said, the stability of the Cube is not a concern. If I mount my 8x10 to my Gitzo G-1570M and lock everything down, there is no play whatsoever. A camera mounted to the C1 Cube will technically have a very small amount of play. I am not referring to the ability to force the camera to be moved, but rather very gently bumping the camera to see if it holds steady, or you if can induce any sort of rhythmic vibration. 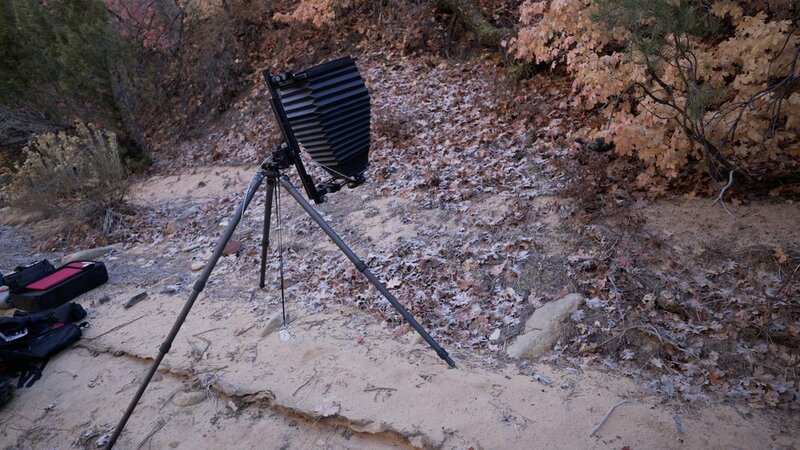 The force that it takes to move an 8x10 camera in this manner is more than what the wind would do. In short, any wind that is strong enough to move the camera this way is also going to make it impossible to take a photo because the camera itself will shake a lot in the wind. I have found that the Arca-Swiss C1 Cube is a very ideal tripod head for my type of photography. It makes intimate landscape photos far easier, and I really appreciate the precise control combined with the compact size. It should be noted that I never hike around with this head mounted to a tripod on the side of my pack. It is removed from my tripod via the Arca-Swiss Quick-Link system, placed in a protective wrap, and transported in my backpack. If you are interested in purchasing the Arca-Swiss C1 Cube and you live in the USA, do me a favor and please reach out to the Arca-Swiss USA rep directly. His name is Rod Klukas, and he is an expert on Arca-Swiss equipment, as well as large format photography. Purchasing directly from Rod is very simple, and he can answer any questions you might have about the equipment. His contact information is listed below. Ballheads are very commonly used for lightweight 35mm and medium format cameras, but heavy large format cameras can often times be very awkward atop a ballhead. A pan tilt head gives more control than a ballhead, and the ability to adjust each axis independent of each other. However, pan tilt heads are often very bulky, and many of the ones suited for large format do not have a quick release assembly. The Arca-Swiss Z2+ is unique because it functions like a pan tilt head, but has the more compact form factor of a ballhead. The large knob closest to the base of the head locks down the forward and backward tilt, and the smaller knob above it locks down the side to side movement. This allows you to set a composition one axis at a time much like a pan tilt head. The Z2+ also features a dual pan base, which is an important feature. The lower panning base allows you to turn the entire tripod head, and orient the collar notch in a particular direction. This is important when aiming the camera downward or upward. The second panning base is up top, and allows adjustment side to side. Unlike a traditional ballhead, the stem cannot rotate side to side, so the upper pan control is necessary to fine tune the composition. Both panning bases lock down with a simple lever lock. Compared to the Arca-Swiss C1 Cube, the Z2+ Monoball is rated for a heavier load, and is even more stable in the wind. 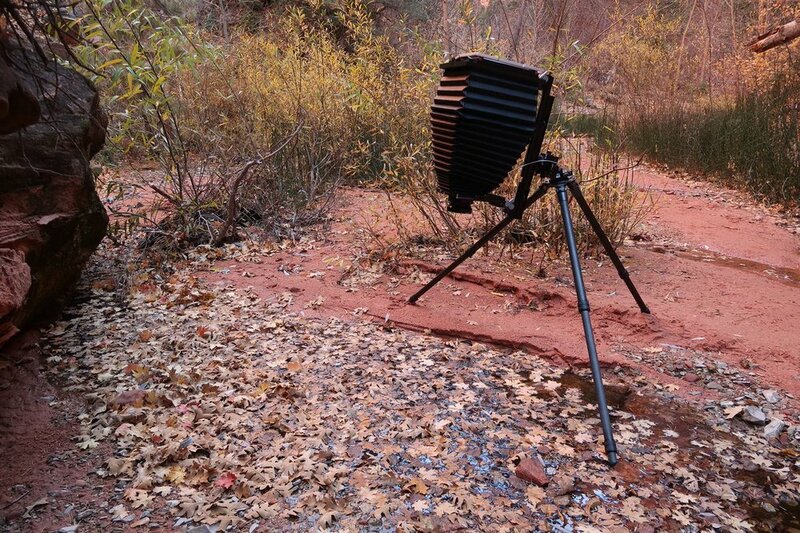 However, when working at awkward angles with my 8x10 pointed at the ground, I prefer the geared controls of the C1 Cube. As a matter of full disclaimer, I do not own this head. It is an evaluation copy that is on loan to me. If you are interested in purchasing the Arca-Swiss Monoball Z2+ and you live in the USA, do me a favor and please reach out to the Arca-Swiss USA rep directly. His name is Rod Klukas, and he is an expert on Arca-Swiss equipment, as well as large format photography. Purchasing directly from Rod is very simple, and he can answer any questions you might have about the equipment. His contact information is listed below. I purchased this tripod head back in 2009 right after I bought the Ebony RW810 8x10 camera. I needed something with a large flat base to help support the camera, and the Gitzo G-1570M was a good solution. This is the most sturdy tripod head I have ever used, and it will hold the camera at awkward angles quite well when photographing intimate landscape scenes on the ground. There are however a few areas that this head could be improved on. Unlike most tripod heads on the market, this one does not have a quick release plate. Instead, there are two screws that must be tightened to the camera. This can make it awkward and slow to setup the camera, though the connection is incredibly secure once mounted. I really wish there was a way to add a long Arca-Swiss style clamp to the top platform of this head, but most of the clamps I have seen are not long enough. The other issue I have with his head is the overall bulk. It is a very awkward shape that is difficult to store in a pack. Hiking with this head attached to my tripod on the side of my pack was also a less than ideal solution. There have been times when the long handles snagged on tree branches. As a result, I typically removed the handles for transport. This made the head much easier to pack in my bag, or to simply leave on the tripod while hiking. After about 6 years of doing this, I finally stripped out one of the threaded inserts for the long handle. Thankfully I was able to order replacement parts before my next trip, but if that happened in the field, I am not sure what I would have done. Overall, I am happy with this head, but I have retired it from normal use because of the lack of a Arca-Swiss compatible quick release clamp, and also because of the overall size and weight of the head. I now use an Arca-Swiss C1 Cube head. That being said, I still think that the Gitzo G-1570M is one of the best values for use with a heavy large format camera. Arca-Swiss Quick-Link receiver shown on a Gitzo GT-5541LS Tripod. I also have a receiver on my Gitzo GT-3532LS to easilly swap heads. The Quick-Link system by Arca-Swiss is a very simple solution to a common problem that many photographers face. I strap my tripod to the side of my pack, and have never liked having a head attached. Not only does it throw my pack off balance, but the head is more likely to be damaged by being slammed into a boulder, tree branch or anything else in the way. In years past, I have been snagged in a tree because my tripod head caught on a low hanging tree branch. 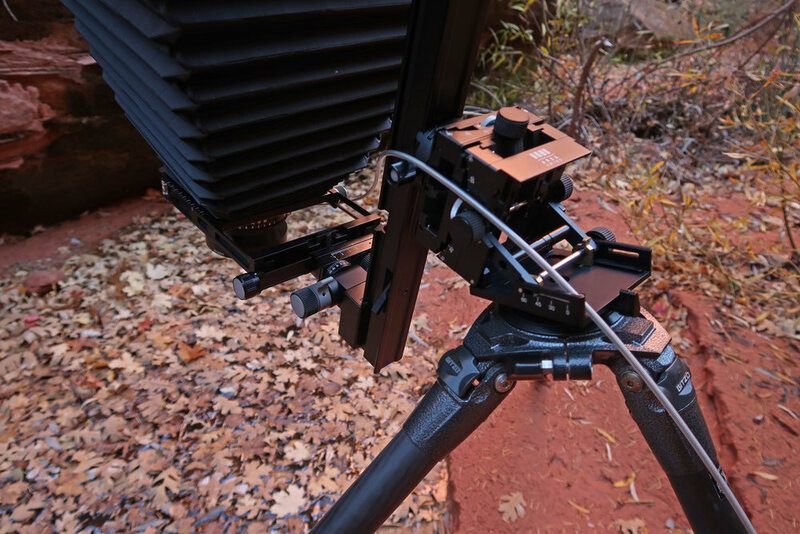 Before I knew about the Quick-Link system, my solution was to disconnect the top plate of my systematic tripod, but this was not ideal because my 3 and 5 series tripods use different top plates. What I really wanted was a universal, lightweight, and rock solid quick release system between the tripod and the tripod head. That is the exact purpose of the Quick-Link system from Arca-Swiss. As show in my video review, the Quick-Link system contains two parts, a breech lock receiver with a rotating collar that attaches to your tripod, and a disk that attaches to the tripod head. Once both pieces have been installed, attaching the tripod head is as easy as dropping it into the receiver, and turning the collar to secure it. I now have receivers on both my 3 Series Gitzo, and my 5 Series Gitzo. This allows me to effortlessly swap heads between tripods. I highly recommend this system if you are like me, and find the need to constantly remove your tripod head while hiking. If you are interested in the Arca-Swiss Quick-Link system, please contact Rod Klukas, the Arca-Swiss USA rep. He is a wealth of knowledge about Arca-Swiss products, and large format photography in general. When is a quick release plate more than a quick release plate? When it has wings. That's right, wings. My Ebony RW810 and Intrepid 8x10 cameras require a quick release plate when using them on my Arca-Swiss C1 Cube, or Z2+ tripod heads. However, the cameras have a very wide base, and a standard quick release plate simply isn't up to the task. For a while, I used a Really Right Stuff 6" Rail as a quick release plate, but it soon became apparent that the camera was not supported as well from side to side as it was from front to back. While searching for an Arca-Swiss compatible quick release plate with better lateral support, I stumbled across the Kessler Kwik Stand XL. This plate was originally intended for use with awkwardly shaped cinema cameras. The wings were designed to provide more surface area when placing the camera on a flat surface like a table. However, it is the perfect design for a large format camera with a very wide base. Those wings provide the much needed side-to-side support and the camera is far more stable. If you buy one of these for use with a view cameras, be sure to remove the rubber strips. They will prevent the plate from sitting flush with your camera, but once they are removed, the plate is rock solid.